Want a sugar free addition to your diet? Try insects! Sugar and most notably added sugars in many of current meals and food products have proven to have far reaching consequences for our overall health. The food industry has therefore been actively developing new products with lower sugar contents to assist consumers in their need for reduced sugar intake and a healthier eating pattern. Insects and insect derived products are naturally sugar free and furthermore provide a wide range of healthy nutrients and would be a perfect addition in a healthy diet. 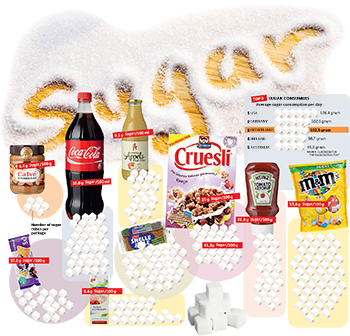 When discussing sugars there are some aspects one needs to consider to really understand this sweet element of our diet and how to consume it responsibly. Sugar consist of two main molecules which are: glucose and fructose and these two elements have very different effects on our body. Glucose is a critical element in our body to provide energy for our cells. When we do not get enough glucose from our diet, the body will produce it from fats and proteins. Fructose however does not appear naturally in our body and only the liver can process this molecule. Unfortunately the liver will convert fructose into fats which are then stored in our bodies. The most direct effect of consuming excessive amounts of sugar is obesity. This is caused by a combination of effects of an unhealthy consumption pattern. Excessive sugar consumption can lead to chronic elevated insulin levels which causes the body trouble in regulating energy and fat distribution to cells. Instead of breaking down the sugars for energy the body stores it as fats. Furthermore too much sugar will also make the brain resistant to the so-called leptin hormone which helps determine the storage of energy and fats in our body. When the brain is no longer able to correctly determine this, it will tell you to start eating more as it believes that it needs more energy and fat. Finally sugar can have addictive effects as it releases opiates and dopamine in the brain which simulates as pleasure experience. We therefore start craving sugar more and more and will consume it even when we don’t need it. Contrary to previous believes, sugar and not saturated fats may be an important factor in causing heart diseases. The fructose in sugar has negative effects on our metabolism, which leads to various heart conditions. Sugar causes our bodies to become resistant to insulin, the hormone responsible for regulating blood sugar levels. As the body becomes more resistant to insulin, it will no longer be able to properly regulate blood sugar and blood sugar levels will rise exponentially and permanently, thus generating the effect of type 2 diabetes. The liver is the most important organ in dealing with the fructose in sugars as it is the only organ capable of dealing with this unnecessary hormone in your body. In small quantities, the liver will temporarily store it and use it when needed. However with excessive fructose it will get turned into fats and eventually will lead to fatty liver disease. This condition is similar to the negative effects of alcohol. An important reason for consuming sugars is that it gives us lots of energy, however it also brings along a lot of empty calories, especially in western diets which contain a lot of added chemical sugars. Insects and insect-derived products are naturally sugar free and full of other essential nutrients and give you a great boost of energy without any added negative effects. At Kreca Ento-Food BV we recommend insects as natural and healthy ingredients in exciting new meals, an addition to existing meals or simply as a healthy snack throughout the day. Try our insects from our webshop and experience the health benefits from this super food!